Looking for the best gluten free shampoo and conditioner on the market? We researched the best gluten-free hair products to create a list of the top shampoos and conditioners for men and women from the leading brands. While many people can use skin and hair care products that contain gluten without issue, those who have severe allergies or sensitive skin may experience uncomfortable or downright dangerous reactions ranging from rashes to hair loss. To combat these side effects, a number of the most reputable brands in the world make and sell all-natural, gluten-free shampoo and conditioner products. In fact, people with eczema say their skin feels softer, smoother, and healthier when they use organic gluten-free products. As you might expect, the highest-quality products came from the top-rated brands. Tree To Tub’s Sensitive Scalp Shampoo gets you the best-rated option as a hypoallergenic, sulfate-free, fragrance-free product made with all organic ingredients. Similarly, LuxeOrganix delivers a popular gluten-free shampoo and conditioner that works for color-treated hair. Finally, Free & Clear Shampoo was our top affordable pick. Read on to learn more about these gluten-free shampoos and hair products. We made a point to include as many options that were also without sulfates, fragrances, parabens, and toxins. Tree to Tub Soapberry Shampoo offers the best gluten free shampoo made especially for people who have sensitive skin on their scalp or allergies. This gentle shampoo uses one of the world’s most underappreciated all-natural ingredients – the soapberry – along with coconut-derived cleansers to deliver shiny, clean hair without the need for alcohols and sulfates. Actually, this organic shampoo is also free of parabens, toxins, SLS, silicone, DEA and MEA, as well as artificial fragrances, and doubles as a psoriasis shampoo. Furthermore, the company’s Sensitive Scalp Shampoo balances the pH of your hair and scalp for optimal health with the addition of natural ingredients like Moroccan oil, aloe, chamomile, and olive leaves. It works well for all skin and hair types, and will leave you dandruff-free. Aside from being hypoallergenic, it is also vegan, fair trade, cruelty-free, and made from premium ingredients. It’s the perfect gluten free shampoo for the whole family. Plus, it’s good for color-treated hair. As the top dermatologist-recommended shampoo that is naturally antibacterial and antifungal, you can’t go wrong with a bottle of Tree to Tub’s Soapberry Shampoo. With nearly perfect reviews on Amazon, customers were nothing short of impressed with this sulfate-free, fragrance-free shampoo. Tree to Tub will even send you a dried soapberry with your purchase and offer you a full-refund if you aren’t satisfied. While not cheap, this gluten-free shampoo is worth the investment in your good health. People who have dry, frizzy, or damaged hair often have difficulty finding organic gluten-free products that will cleanse their hair thoroughly without weighing it down. LuxeOrganix Rejuvenating Shampoo and Conditioner is one of a kind in this regard. This set was especially designed to help repair and nourish hair with ingredients like Moroccan argan oil and safe surfactants derived from coconut oil. This gluten-free shampoo and conditioner contains no sulfates, parabens, sodium chloride, phthalates or alcohols, and the company does not test their products on animals. As one of the most popular gluten-free hair products on the market, it is safe for colored, dry, damaged, and keratin-treated hair. Moreover, it is even safe enough to use with hair extensions. Additionally, using both products regularly has been shown to relieve itchy scalp and stop dandruff. The result is beautiful, soft, smooth and healthy hair without frizz. It also helps that this product smells really good. With a light orange and vanilla scent, it’s refreshing but not overpowering and does not linger for long. Thanks to lightweight ingredients, you will not have to worry about buildup that can weigh your hair down. 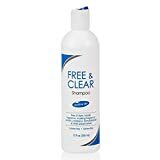 Free & Clear Shampoo is one of the top gluten-free shampoo products available today that is completely hypoallergenic and free of all harsh chemicals. Its primary cleansing agent is a coconut derivative called coco-glucoside and does a fantastic job of removing oil and grease buildup, adding shine, and creating volume. Dermatologist-tested for sensitive skin, this highly-rated shampoo contains no dyes, fragrances, proteins, parabens, sulfates, formaldehyde or other preservatives, and because of this, it’s safe for use on color-treated hair. Further, it features an advanced formula of all-natural organic ingredients to balance and maintain your hair and scalp’s delicate pH. The result is an irritation-free shampoo that will keep your hair clean, soft, smooth, and dandruff-free. From men with short, thin hair to women with thick curly hair, this is a gluten-free, sulfate-free, and fragrance-free shampoo that will truly work for everyone. People who have a gluten intolerance, aloe allergies, alcohol sensitivities, and even eczema rely on Free & Clear Shampoo to gently cleanse their hair without irritating their sensitive skin or scalp. While the packaging is simple, the brand does not rely on marketing gimmicks. Instead, it’s focused on providing men and women with the best shampoo products. Just read the Amazon reviews and you’ll be sold. Free & Clear also offers a hypoallergenic conditioner. 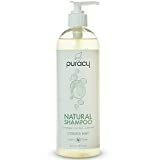 Puracy’s Natural Daily Shampoo offers a powerful formula that will cleanse, moisturize, and protect your scalp and hair. The sulfate and gluten free recipe comes with coconut-based cleansers that provide a thick lather without the need for harmful toxins and alcohols. This natural shampoo is hypoallergenic and contains vitamin E, vitamin B5, squalene derived from olive oil, beet sugar extract, ivy, black walnut leaf, soapbark, and ginseng extract to hydrate your hair, build strength, and add shine. The combination of quality ingredients will generally work to condition and soften your hair while fighting frizz. The end result is a more manageable and healthy look and feel. Developed for men and women, it’s one of the few gluten free shampoo products available today that was created by a team of chemists for people who have unique skin sensitivities. Puracy recommends using the product daily for a period of two weeks to see the best possible results. Hundreds of testimonials and customer reviews confirmed the shampoo worked wonders for all hair types. Specifically, Amazon reviews mentioned how this Natural Daily Shampoo not only left their hair clean and soft, but it also healed their scalps and cleared up dandruff within days. As for the invigorating scent, citrus, eucalyptus, and mint combine for a great smell that is light and fresh. so it will not overpower your cologne or perfume. This gluten-free shampoo is one of the more affordable options on our list, and with a 100% satisfaction guarantee, you can get it risk-free. Challenger’s Daily Shampoo and Conditioner were designed for people who wash their hair daily but want a hydrating and nourishing product. Though most experts recommend avoiding daily shampooing, your job or hobby may demand it. Both the shampoo and the conditioner are free from artificial colors, sulfates, and gluten, and that means it’s a great choice for anyone with skin sensitivities who finds it difficult to cleanse without irritation. Ingredients like keratin, vitamin C and D, rice protein, argan oil, and biotin will help strengthen your hair without weighing it down. The company’s hair care products also contain tea tree, peppermint, and eucalyptus oils. In fact, tea tree oil acts as a natural anti-bacterial and antifungal, and has been known to reduce allergic skin reaction and inflammation. When using this shampoo and conditioner, that gentle cooling sensation is actually the tea tree oil working. Similarly, the other essential oils will moisturize and condition your scalp, leaving it soft and smooth. Both products also come with a natural vanilla scent for a good, clean smell all day. 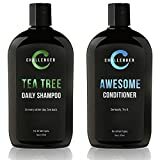 As a gluten-free, sulfate-free shampoo and conditioner set that works with colored-treated hair and comes infused with natural ingredients and vitamins, we recommend you try Challenger. If you’re looking for a unique and affordable shampoo that will infuse your hair with moisture and still add volume, Acure Mega Moisture Shampoo is the answer. Its main ingredients are argan oil and pumpkin, which work to soften hair and leave it more manageable without causing scalp or skin irritation. Other all-natural ingredients include sweet almond seed extract, cassia bark oil, pomegranate extract, calendula extract, and more. Acure is also one of the few hair care product manufacturers out there to utilize technologies like chlorella growth factor and plant stem cells. Given the all-natural organic ingredients list, this shampoo is free of sulfates, parabens, pthalates, mineral oil, DEA, formaldehyde, petrolatum, and paraffin. Because it contains no harsh ingredients, it is safe for use with color-treated, dry, damaged, and over-processed hair. This hydrating formula will condition your hair into looking and feeling soft, smooth and healthy. Plus, it smells great with a very light scent of sweet almonds, but it’s not overwhelming and quickly fades as your hair dries. Overall, the brand’s entire hair care line is gluten-free, so men and women with sensitive skin or allergies can have peace of mind using Acure’s gluten-free shampoo. For an affordable yet professional salon-quality gluten-free shampoo, look no further than Andalou Naturals Lavender & Biotin Full Volume Shampoo. It contains biotin B-complex that is designed to help strengthen and thicken hair while adding clean, shiny volume for a fuller look. This shampoo was formulated for all hair types, but specifically works best for men and women with thin or fine hair. Other all natural, organic ingredients include aloe, lavender extract, shea butter, flax seed oil, white tea extract, chamomile, grape seed oil, and olive oil. This shampoo provides gentle cleansing with ample moisture. and those who have dry hair say they get ample moisture. It is safe enough for daily use and is perfect for men, women, and children alike. And you’ll love the light, refreshing lavender scent – it truly smells amazing. Dedicated to quality ingredients and manufacturing, Andalou Naturals gluten-free shampoo is made in California, and happens to also be vegan and cruelty-free. As the cheapest shampoo on our list, you’ll appreciate the value. Understanding the ingredients list on hair care products can be challenging. Here’s a list of terms to look for when getting a gluten-free shampoo. If you see any one of the following terms in the ingredients list, it can mean the shampoo, conditioner, or hair product may contain ingredients formulated from wheat, barley, or rye. Make sure to only choose gluten-free shampoo products that explicitly state they are so. Getting a gluten-free shampoo and conditioner can make all the difference for men and women with allergies or sensitive skin. Even if you haven’t noticed any adverse reactions so far, if a gluten-free shampoo and conditioner can keep your hair just as healthy, shiny, and manageable as other hair care products, we think it makes sense to avoid the issue altogether. Whether you have dry, oily, damaged, thick, thin, straight, curly, wavy, or color-treated hair, our list of the best gluten-free products can help you find an organic shampoo and conditioner that meets your unique needs.